Presidents, a king and queen, a prince, a chancellor and a handyman from Maine joined family and friends to celebrate the life of President George H.W. Bush, Wednesday. The day began with a 21-gun salute and the song Hail to the Chief as Bush’s flag-covered casket came down from the Capitol where he had lain in state. The vehicle carrying his casket passed by the White House where Bush had served the country as its 41st president. 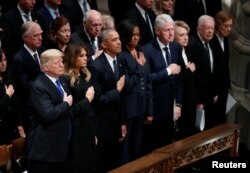 U.S. President Donald Trump and Melania Trump stand with former President Barack Obama, Michelle Obama, former President Bill Clinton, Hillary Clinton, former President Jimmy Carter and Rosalyn Carter at the funeral of former president George H.W. Bush. At the National Cathedral in Washington D.C, President Donald Trump sat next to former presidents Barack Obama, Bill Clinton and Jimmy Carter, and their wives. Across the aisle were Bush’s son George W. Bush, the country’s 43rd president, and the rest of the Bush family. Presidential historian Jon Meacham called Bush “America’s last great soldier-statesman” in the first of four eulogies. Meacham described how Bush was shot down over the Pacific Ocean as a 20-year-old Navy pilot. He reminded others of how the event shaped Bush’s mission in life. Another family friend, former Senator Alan Simpson, brought laughter to the full cathedral with his story of loyalty and friendship. 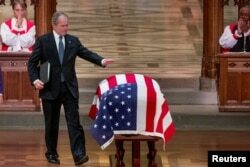 An emotional former President George W. Bush touches the flag-draped casket of his father, former President George H.W. Bush, after speaking during his State Funeral at the National Cathedral, Dec. 5, 2018, in Washington. George W. Bush remembered his father as “the brightest of a thousand points of light.” He said his father was someone who “made his children believe anything was possible.” In a lighter moment, Bush said, “To us he was close to perfect, but not totally perfect…The man couldn’t stomach vegetables, especially broccoli.” The late president was known for his dislike of the vegetable. The kinder and gentler tone of the state funeral had been set much earlier. The Bush family invited President Donald Trump to attend the event. Trump was not invited to Barbara Bush’s funeral in April or the recent funeral of Senator John McCain. 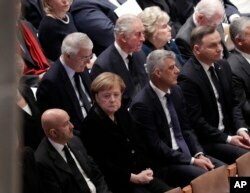 Britain's Prince Charles, second from left, back row, and German Chancellor Angela Merkel, second from left, bottom row, are shown seated during a State Funeral for former President George H.W. Bush. Representatives from countries around the word included King Abdullah II and Queen Rania of Jordan, Prince Charles of Britain, German Chancellor Angela Merkel, and Polish President Andrzej Duda. Only people with an invitation could attend the funeral in the cathedral. Among them was Mike Lovejoy, a man who has been fixing things at the Bush’s summer home in Kennebunkport, Maine for many years. At the end of the state funeral, Bush’s casket returned to Houston to lie in repose at St. Martin’s Episcopal Church. On Thursday, Bush will be buried on the grounds of his presidential library at Texas A&M University. There, he will be buried next to his wife Barbara Bush and his daughter Robin. Hai Do wrote this story for Learning English. Mario Ritter Jr. was the editor.